Samsung Electronics America today announced that their 5G-ready massive MIMO solutions on Sprint’s 2.5 GHz TDD-LTE network are now in commercial service. As part of Sprint’s network, Samsung’s massive MIMO solutions deliver improved 4G LTE throughput and capacity to Sprint’s subscribers. Additionally, this helps provide Sprint with a seamless upgrade path to 5G New Radio (NR), utilizing the carrier’s deep 2.5 GHz spectrum. In February 2018, Sprint announced its selection of Samsung as a massive MIMO provider for their future 5G mobile network launch in the U.S., an important milestone for the carrier. Samsung’s massive MIMO can provide a way for operators to inject new capacity into their network without having to purchase more spectrum or add new base stations. It is being used by Sprint to significantly boost LTE network speeds and capacity for millions of U.S. customers, while improving network efficiencies through advanced beam-forming. said Lyle Nyffeler, Vice President, Networks Division, Samsung Electronics America. 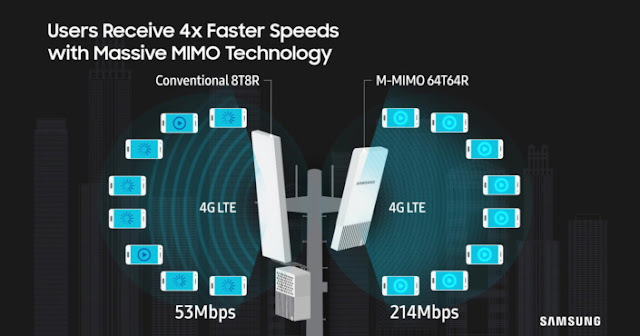 In addition to delivering substantial capacity gains using the same amount of spectrum, Samsung’s MIMO solution offers a seamless path through split mode, enabling deployment of 4G and 5G NR on the same radio, without any hardware changes. The massive MIMO implementation also includes the Samsung CDU 30, a higher capacity digital unit and software that enables gigabit level speeds while supporting eMTC and NB-IoT.